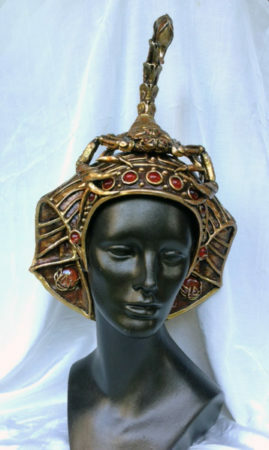 We have been honored to be commissioned to make several magnificent Egyptian queen/goddess headdresses. The first was Cleopatra, based on the 1963 Elizabeth Taylor film costume, which was clearly inspired by tomb paintings of Nekhbet, the vulture goddess, and Wadjet, the cobra goddess. We have made 3 incarnations of this one so far. The second was Nefertari. She was the first wife of Ramses the Great. Her headdress also incorporated vulture and cobra elements, topped by an amazing double plume. The third was recently completed and is equally stunning. 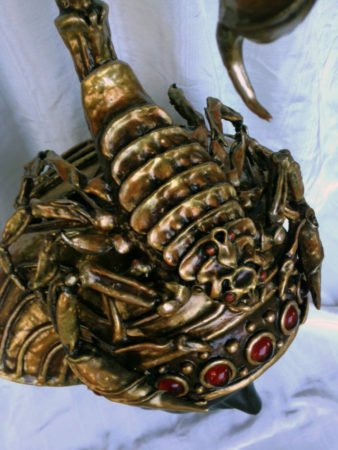 This one is an homage to Selket, the scorpion goddess. 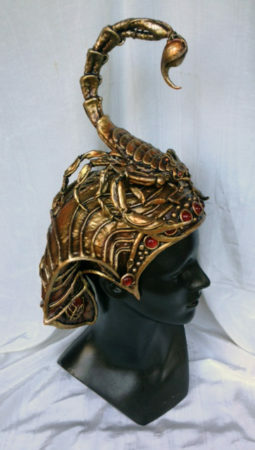 Based on a tiny elegant statue of gold found in the tomb of King Tutankhamen, this headdress features a stylized scorpion atop an ornamented headscarf form. We love the research and the technical challenges of these kinds of projects.